Contemporary chamber jazz with influences ranging from 60s blue note to Debussy. When Jasmine Lovell-Smith released her debut album, Fortune Songs, in 2012, she’d only recently moved to New York from her native New Zealand. In the years since, the saxophonist/composer has logged many more miles, moving first to Connecticut, where she studied under the legendary Anthony Braxton, and then to Morelia, Mexico, where she has absorbed the sounds of the local folk music along with chamber music and jazz. 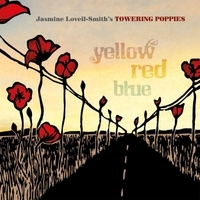 All of those experiences and influences bear fruit on Yellow Red Blue, the second release by Lovell-Smith’s evocative quintet Towering Poppies. In keeping with the coloristic tenor of the album’s title, Lovell-Smith has widened the sonic palette of the band this time out; where Fortune Songs paired her soprano saxophone with trumpet, Yellow Red Blue substitutes the bass clarinet of Josh Sinton, leader of the adventurous band Ideal Bread. They’re joined by the versatile rhythm section of pianist Cat Toren, bassist Adam Hopkins, and drummer Kate Gentile. The core band is also supplemented on three tracks by the Morelia-based string quartet Cuarteto la Matraca. Yellow Red Blue, due out November 4, retains the lyrical and song-like qualities of Towering Poppies’ debut while adding rich new layers and intriguing complexity. The album and its title tune borrow their name from a painting by Mark Rothko, an association that’s particularly suggestive: like the renowned Color Field painter, Lovell-Smith’s music consists of bold swaths of deceptively simple colors which gradually reveal the intensity and profundity of their depths and relationships.